Boasting a wide range room types and an array of facilities, this five-star Fiji accommodation is the perfect location for a relaxing romantic getaway or family friendly holiday. Sheraton Fiji Resort is set on the beachfront on Denarau Island where you can relax by the lagoon style swimming pool, enjoy fresh meals from an number of restaurants, play a round of golf or treat yourself to something special in the day spa. The kids will love the kids club and playground and kid-friendly dining options. Sheraton Fiji Resort on Denarau Island in Fiji has everything you need for a fantastic family holiday, from a playground and kids club for the children to a day spa and golf course for the adults. 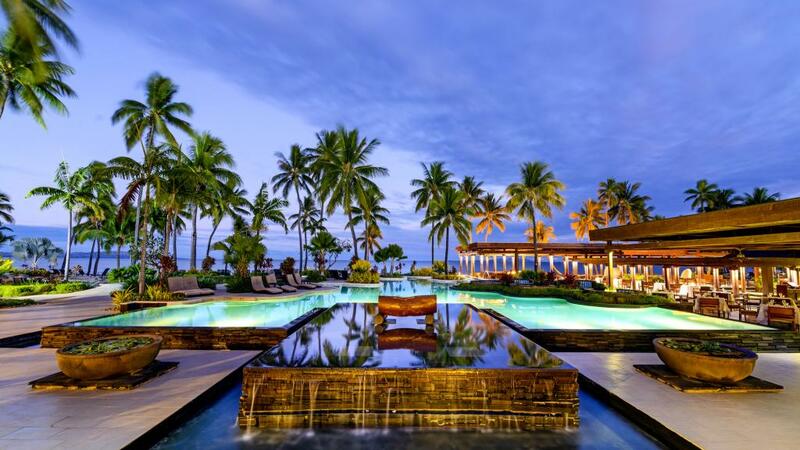 This luxury five star Fiji accommodation boasts spacious and comfortable rooms with contemporary amenities. Enjoy the beachfront location of the Sheraton Fiji Resort while being not far from shops, a wide variety of dining options and day tour departure points like the Port Denarau Marina.